Late last year the German company be quiet! 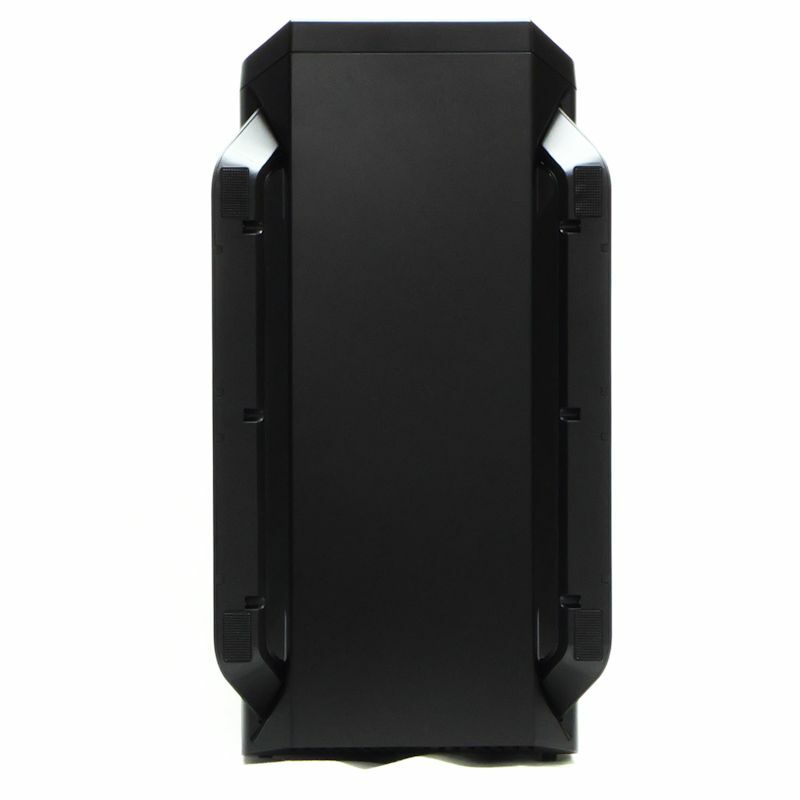 released a new case, the Silent Base 800. What does be quiet! have to add to the world of cases? 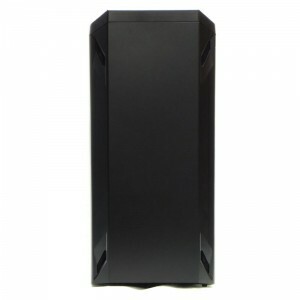 The world of PC cases is filled with every innovation that engineers and craftsmen can devise. What makes their case so good that we would pick this, rather than another? 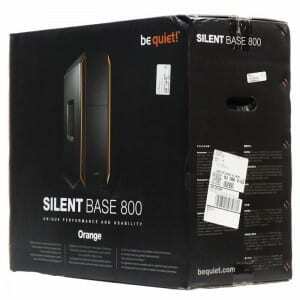 Today we will explore the Silent Base 800 and find out. Be quiet! Is a brand name of products from Listan GmbH and Co. The name be quiet! tells us that quiet is their goal. Their website tells us, “be quiet! is a premium brand manufacturer of power supplies and cooling solutions for your desktop PC.” They tell us they were, “one of the first manufacturers of noise-dampening mats for PCs.” Their cooling products include heatsinks and fans, and they sell many different power supplies as well. 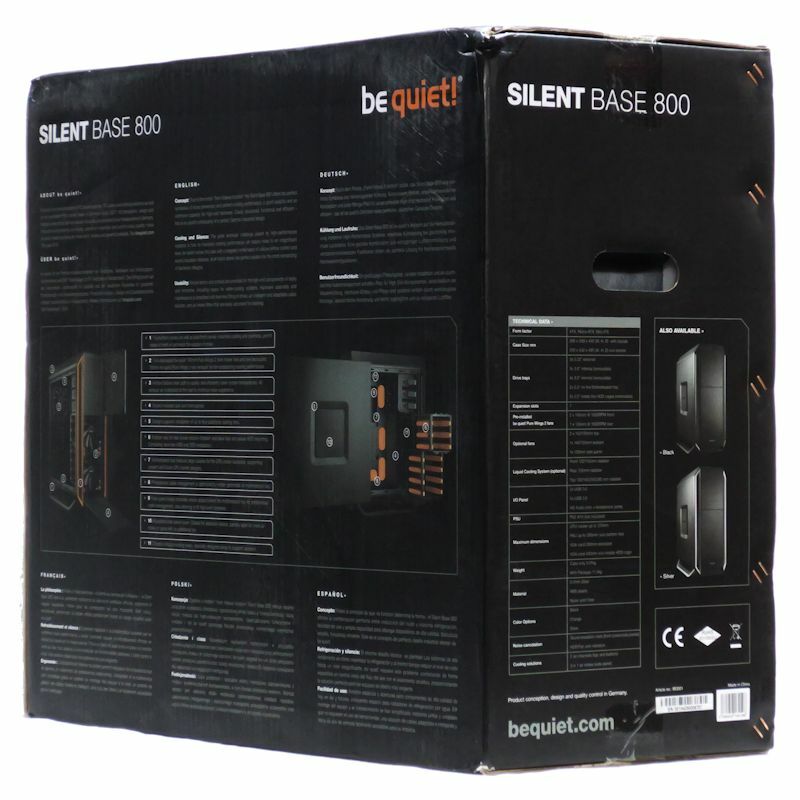 The Silent Base 800 is the first case from be quiet! be quiet! . 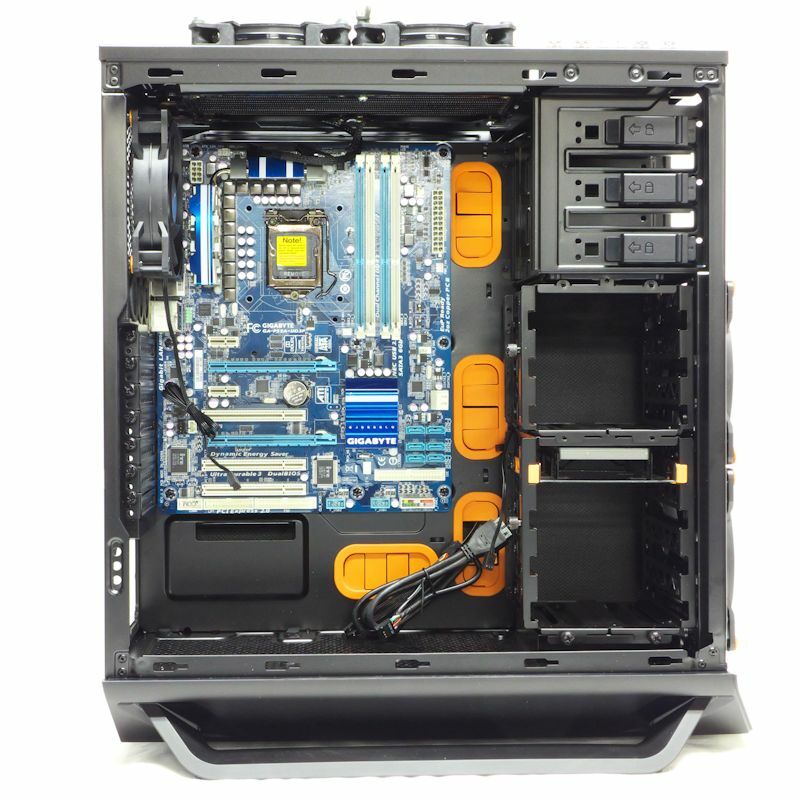 . . introduces its first chassis – the Silent Base 800. 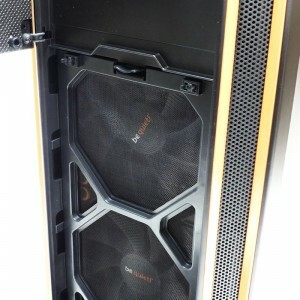 This case offers generous space and is firmly aimed at the premium segment – for customers who want high end features in a low noise system. With its innovative design, be quiet! 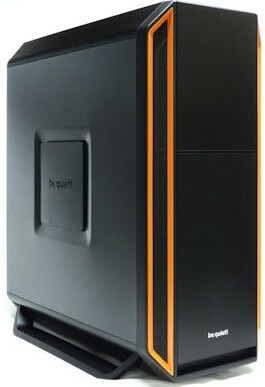 guarantees silent operation while delivering excellent cooling performance. True to the motto ‘Form Follows Function’, each component in the Silent Base 800 fulfils a specific purpose in order to increase user-friendliness and bring performance to a new level. If you are interested in learning more about this case, the press release is quite informative, and can be read here. Exploring the Outside of the Silent Base 800. The Silent Base 800 comes in a shipping box covered with ads and pictures. 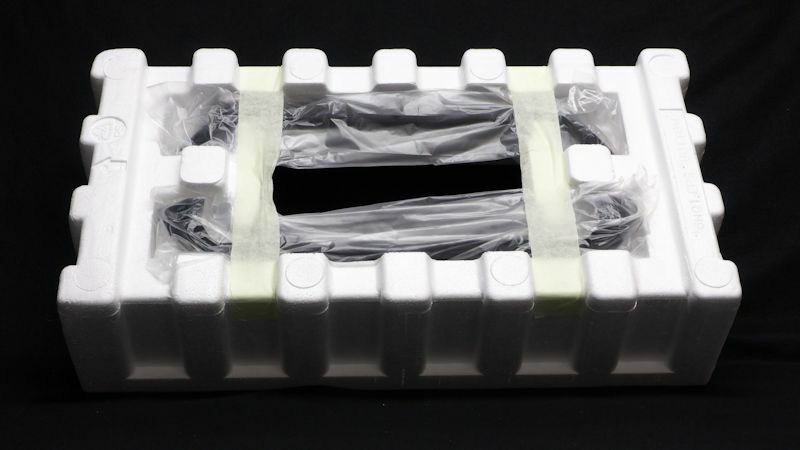 The top and bottom of the case is capped in Styrofoam and wrapped in a cloth bag. In the top cap, the feet were stored apart from the case. You just shove the feet in the bottom to get them on. Simple. The case front is secured with masking tape. 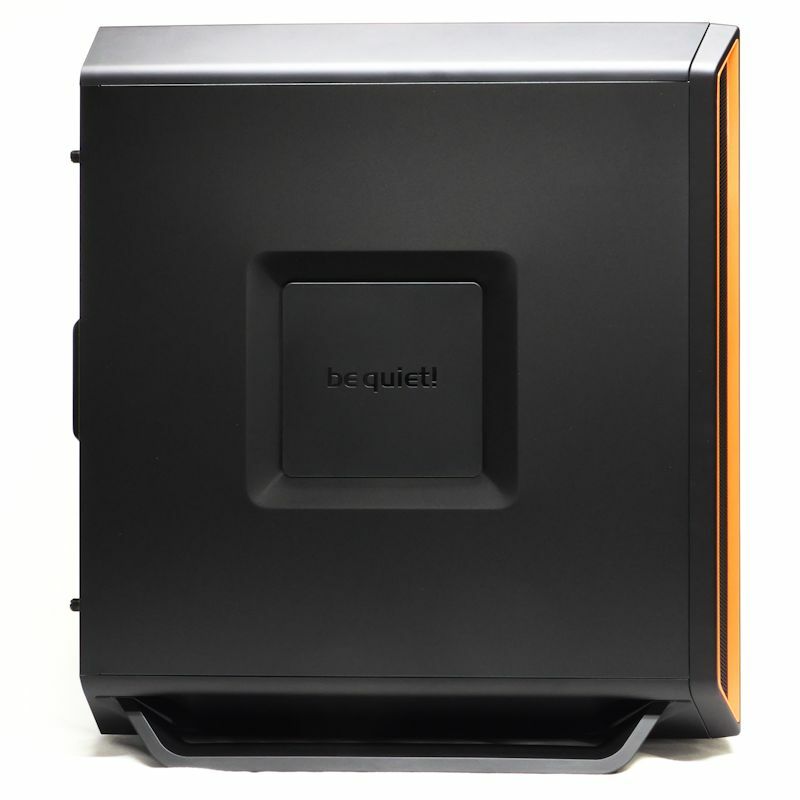 On the left side, you can see the first of the side vents, complete with the be quiet! logo. 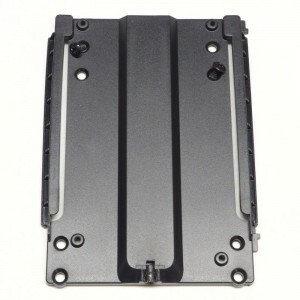 Note that the side cover is held on with two thumbscrews at the rear of the case. The rear view shows a pretty standard back end, except that the generous top and bottom covers have vents. There also seems to be a handle here. 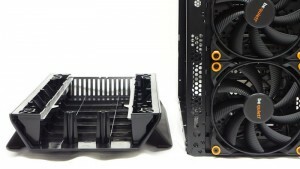 If you pull it, you get an excellent filter that will easily cover the PSU’s fan and a 140 mm bottom fan on the chassis. The top of the case shows the IO cluster in the front right corner. Be quiet! apparently made the choice that the IO cluster would be accessible to you if it sat on the floor next to you. 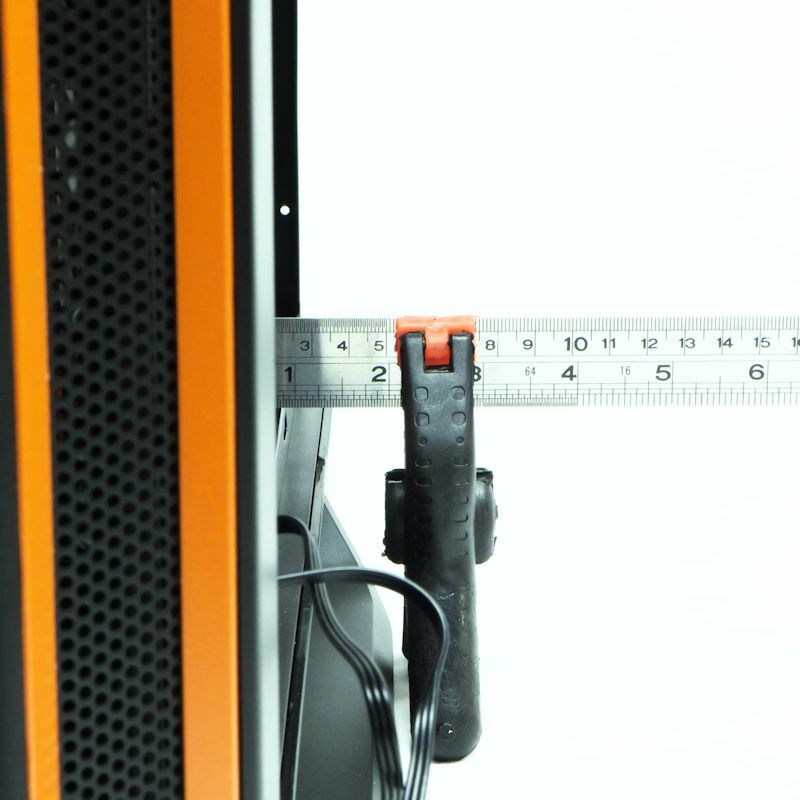 These ports would require you to stand up if the case sits on your desk. One fine decision is to include four USB ports. The USB2 ports are handy for wireless mice, wireless keyboards and the like. Note that you open the front door at the top. The right cover shows another be quiet! vent. At this point it is closed. 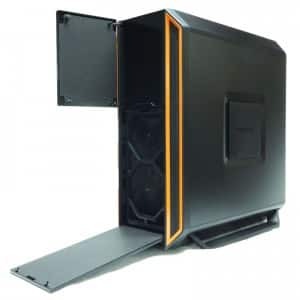 In front, the fan cover comes down like a drawbridge when you push at its top. You can also see the vents within the orange lines. 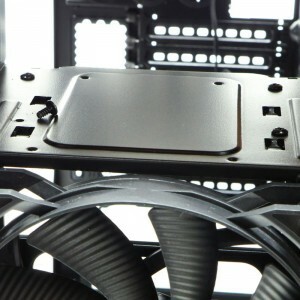 This is where the front fans get their air. At the top, a front door opens to show the 5.25” slot covers. There are only three real slots. The top one is a dummy. A closeup of the front filter shows it is the same excellent optimal mesh that be quiet! 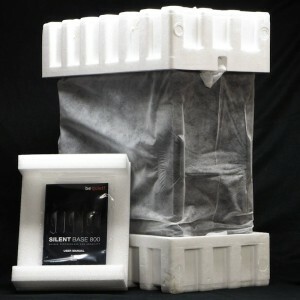 used on the case’s bottom filter. The tab at the top of the filter releases it for cleaning and for access to the front area. Opening the left panel, we see that it is covered with what be quiet! 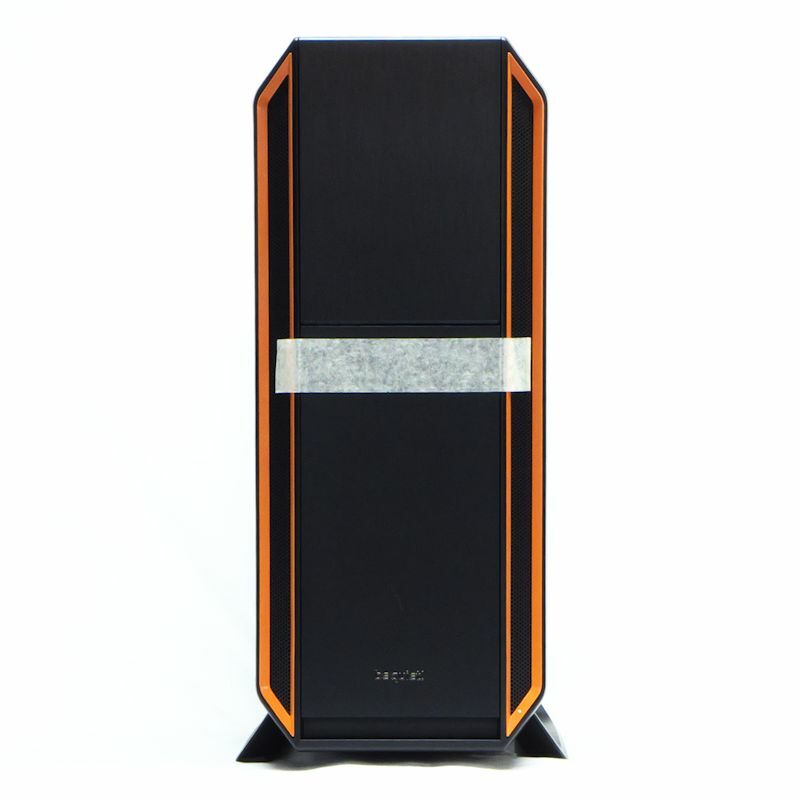 calls its “brand new anechoic material.” The side vent simply pops out. When the side vent pops out, it exposes a fake filter. You see them over and over. These do not stop much dust, but they do restrict a lot of airflow. The folks at be quiet! are obviously aware they could do better – they are using topnotch stuff in the front and bottom filters. Now, do look at that thumbscrew. It has a tapered shaft that leads to the threads. A paragon of thumbscrews. It never allows you to miss or mis-align the threads you are aiming for. It makes working on these cases ever so much easier. This may seem like a trivial matter, but be quiet! deserves credit for choosing such labor-saving thumbscrews. 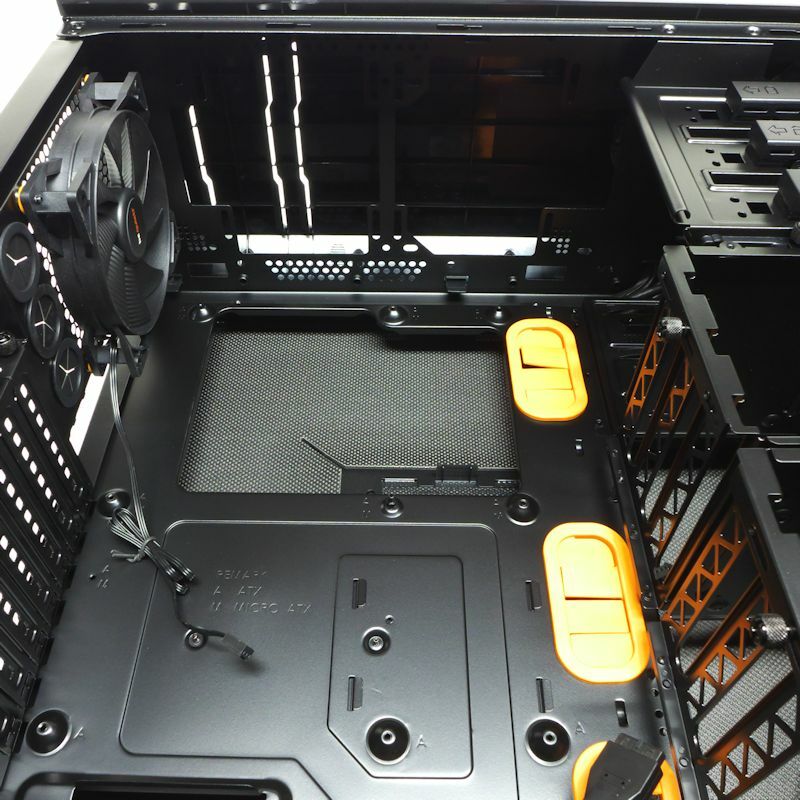 Now we view the interior of the Silent Base 800. 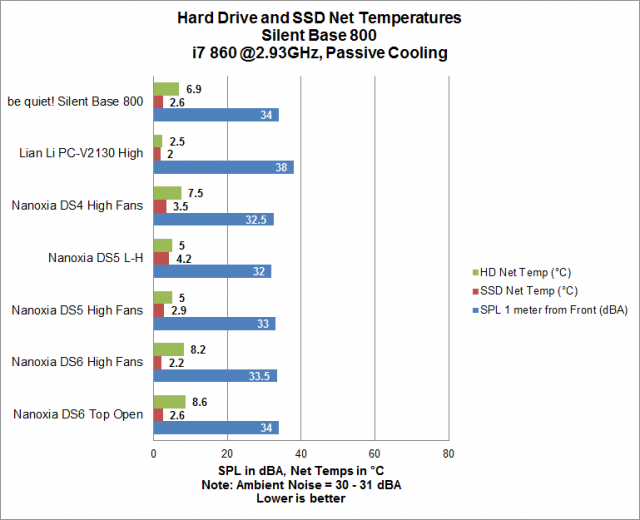 Right in the middle, where we can’t ignore it, is the gaping CPU hole. Wow. Big. 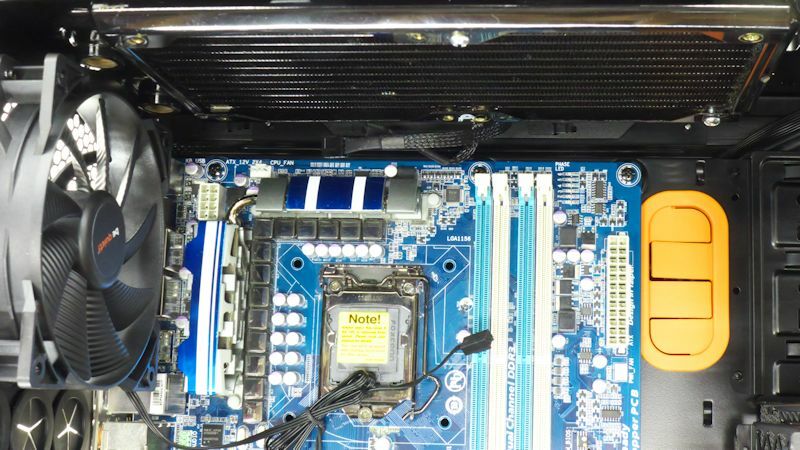 It extends above the top motherboard screws on the left, all the way over to the motherboard screws on the right, down to the center motherboard screws, and all the way over to the leftmost screw. 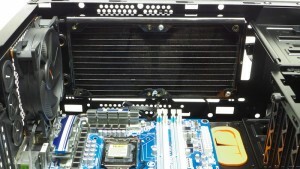 It is as big as it can be to surround any CPU socket – which of course, is its job. In the upper left corner is the triangular space that the EPS12V plug goes through. I’ll tell you in advance it is comfortably big enough for an EPS plug to go through with no issues. Four cable pass through grommets – colored orange to match the trim on the outside. 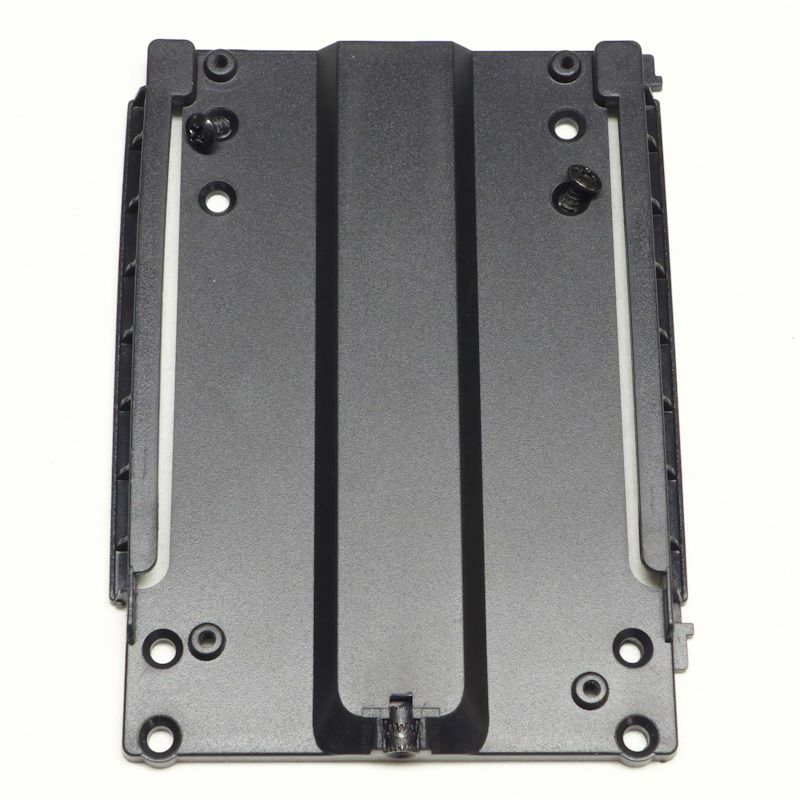 On this side of the 5.25” bay, we see slide locks for slot devices. Those slides work great, and they are plenty big for large hands. 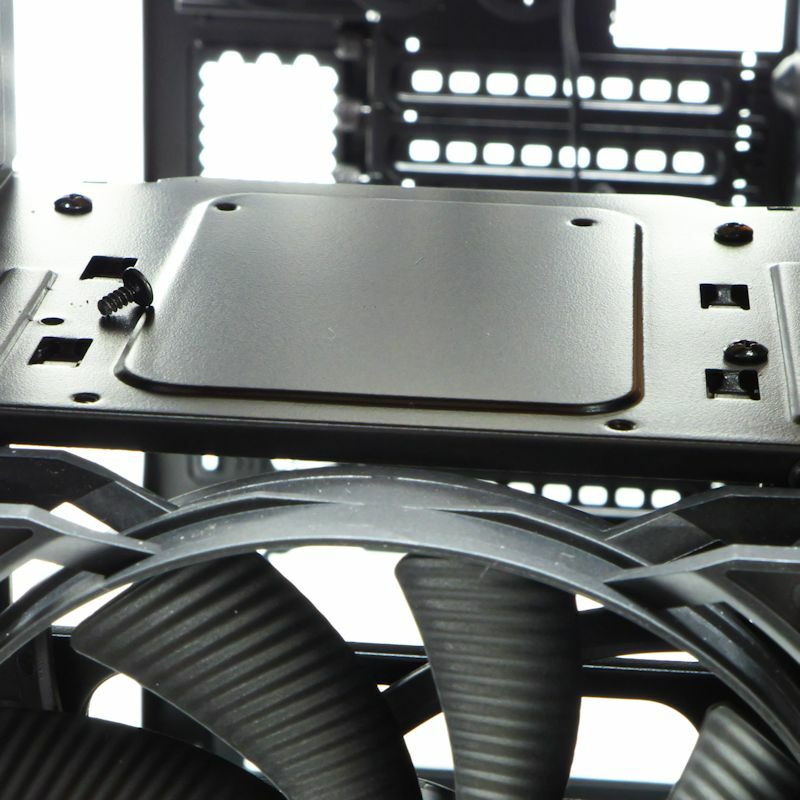 Looking up, we see an arching top and essentially no grill at the top of the metal part of the case. Of course, you say, that will always be covered. But enough manufacturers have grills there that be quiet! should be praised for leaving it open. 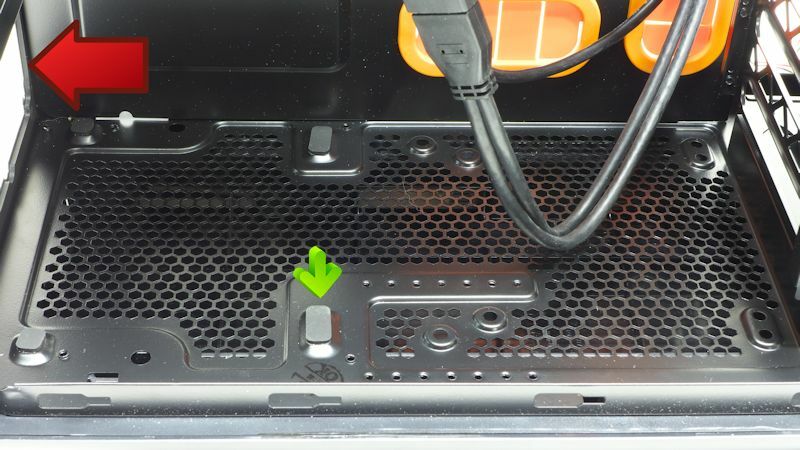 After all, if you put a radiator up there – an AIO, perhaps – you don’t want anything obstructing airflow. 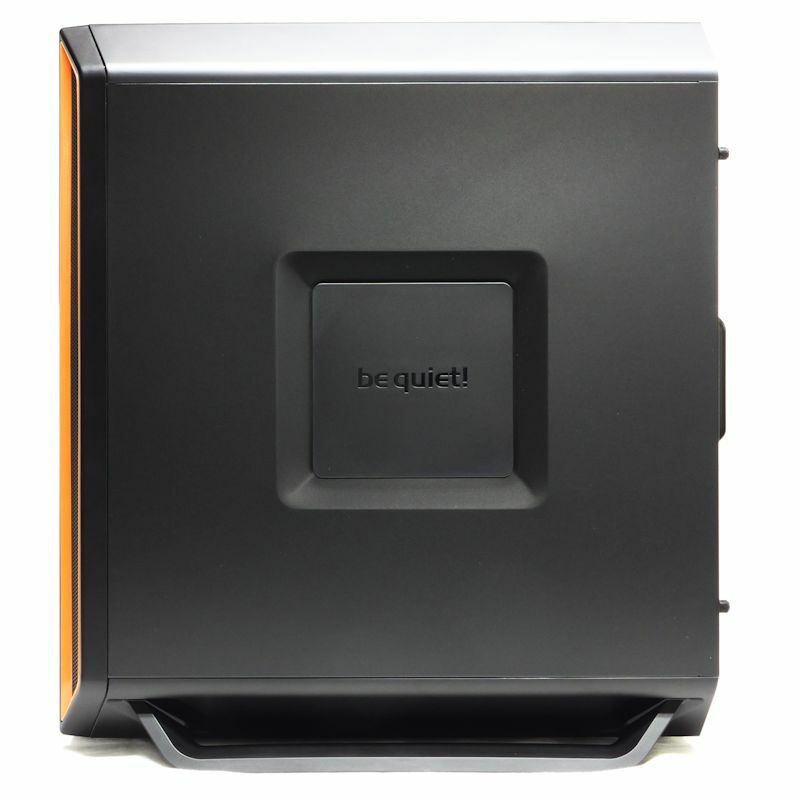 On the left, we see those grooved blades on the be quiet! exhaust fan. It looks like they didn’t put cheap fans in their case, but used the same fans they sell at retail. 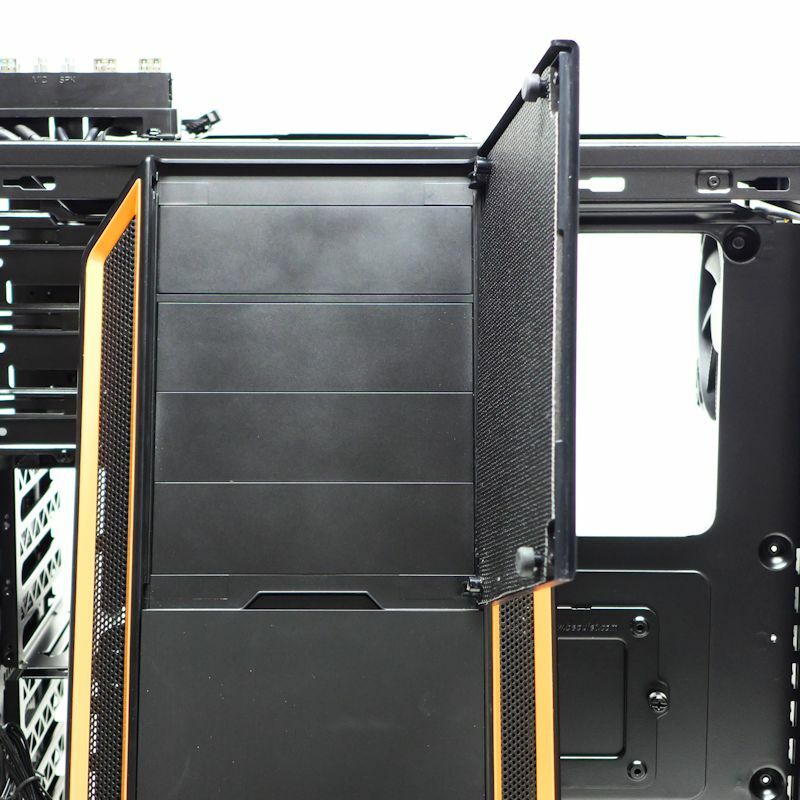 And on the right, look at how the latticework on the sides of the HD cages are open to airflow. Great news. 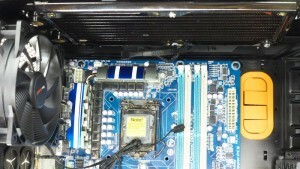 Finally, along the top of the motherboard tray you can see a couple of tabs. Those hold the plastic top on. In the next picture, we have a red arrow pointing to one of the tabs holding on the front cover. Here is where the manual lets you down. 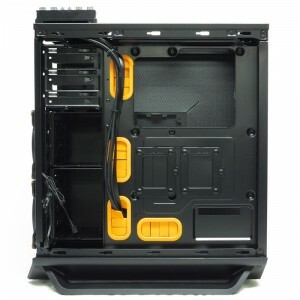 Section 8.3.3 says “Remove the front panel.” How? You could easily miss those tabs. When the covers come off, a couple of things become apparent. First of all, the IO port and system on/off button unplug with one-way connectors. You can’t plug them in wrong. Second, the stops on that top cover will only allow you to use 25 mm thick fans. Sorry, 38 mm fan lovers. 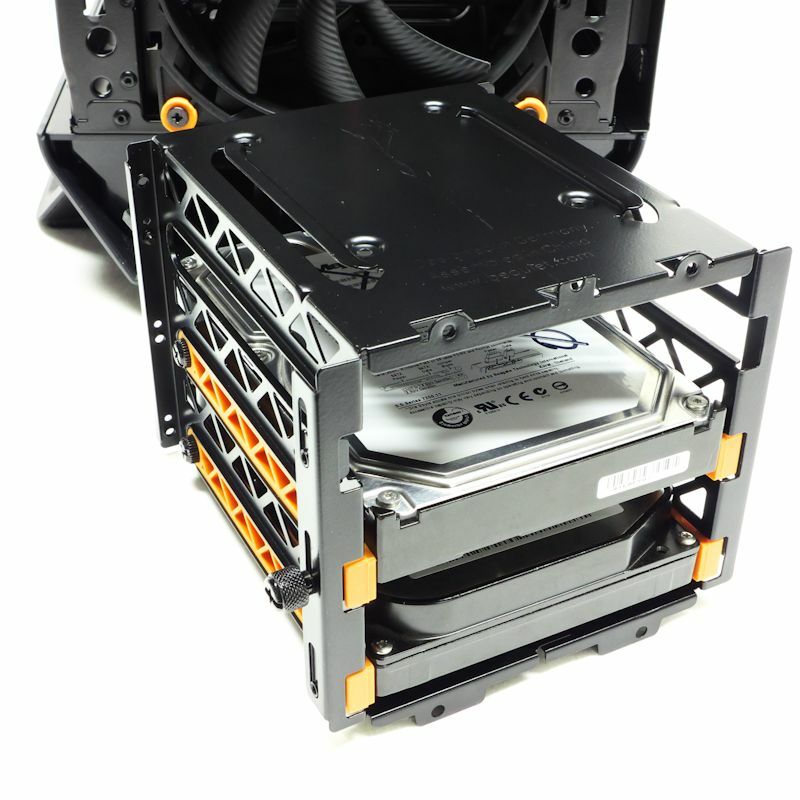 Next up, a glamor shot of a naked case, steel skeleton and all. It looks light and airy, as it should. 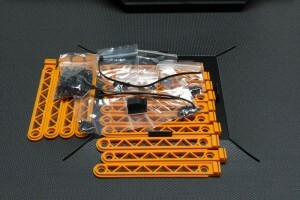 The back side of the motherboard tray is next. We will start at the upper left corner: no slide locks for the 5.25” bay. 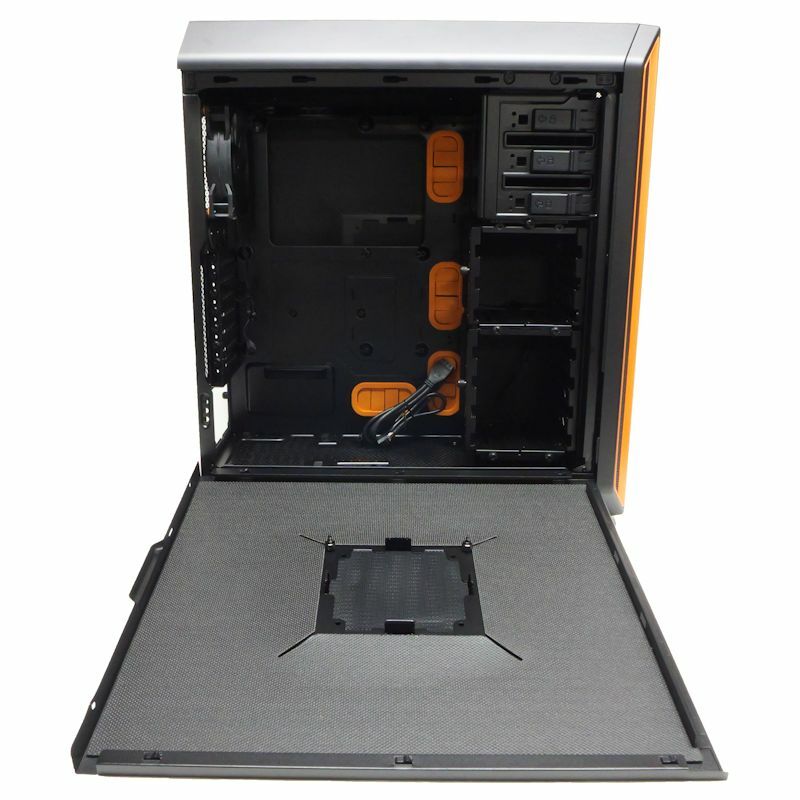 Luckily, in a well-made case like this one, you only need to lock one side. 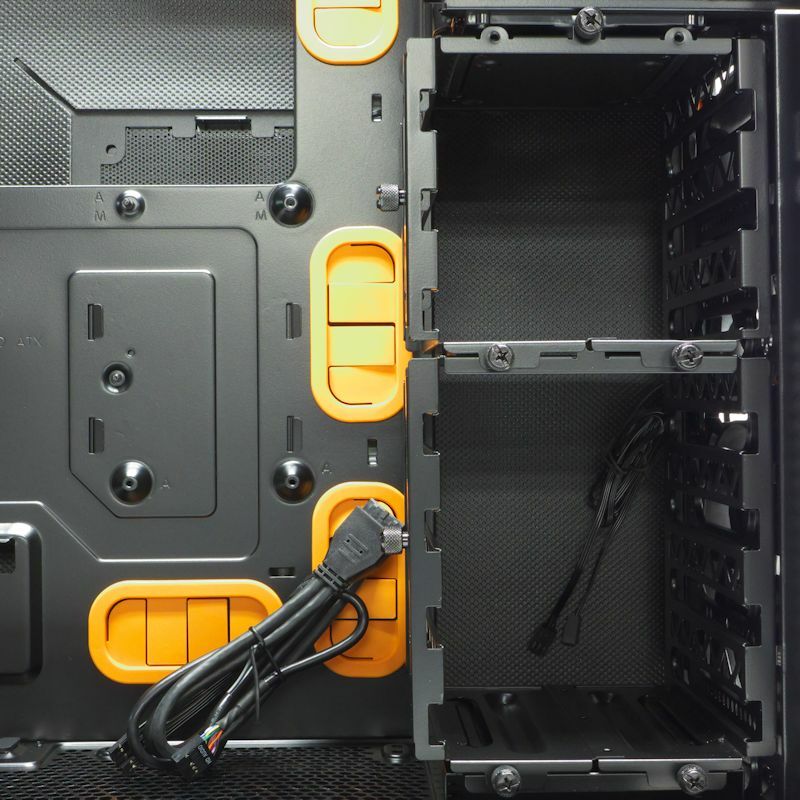 Between the set of case cables and the edge of the HD cage, you can make out the thumbscrew that helps hold the upper HD cage. A point worth noting is the paucity of tie-down points. This case has one, no more. Not good. There are two doohickeys that are held on with one thumbscrew apiece. Wonder what they are? 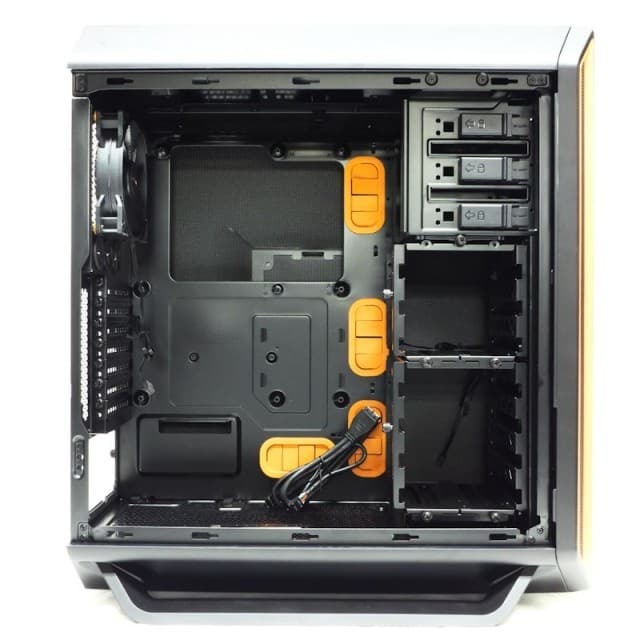 Those little doohickeys are 2.5” frames for mounting SSD’s to the back of the motherboard tray. There are two slots that make hinges, so each frame is solidly mounted with that single thumbscrew. You can also see one of the sills for the side panel. These would come in handy if you put a heavy fan on the panel. Accessories. 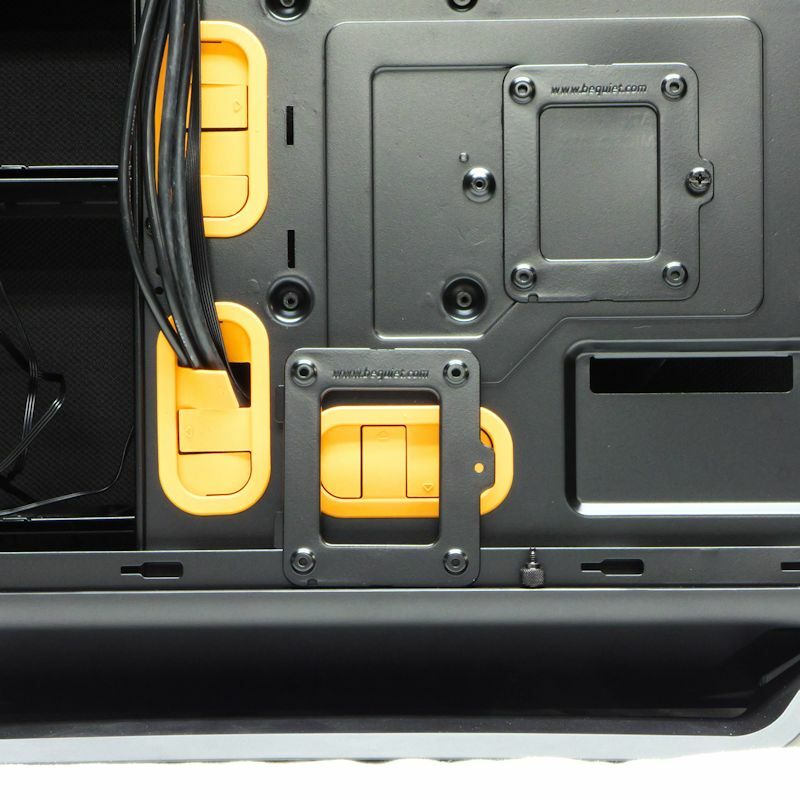 Actually, small parts since they are integral to the functionality of the case. Rubber rails, screws, zip-ties, and a cable clip. 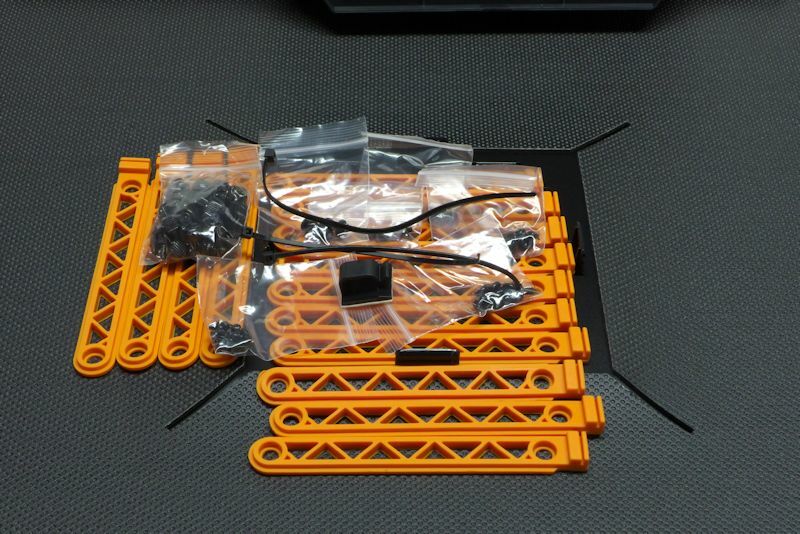 You can also buy “Self Adhesive Cable Tie Mount Bases,” a.k.a. 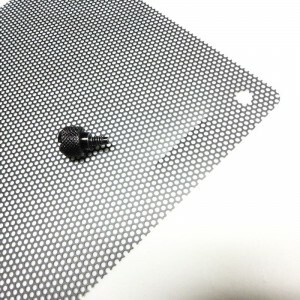 “wire tie attachment pads” or “stick on wire tie down points.” You will need those to supply tie down points absent from the motherboard tray. Here is how you use those rubber rails and those short thumbscrews. It’s a little more work than in some cases, but you end up with firm grips that nonetheless attenuate vibration. 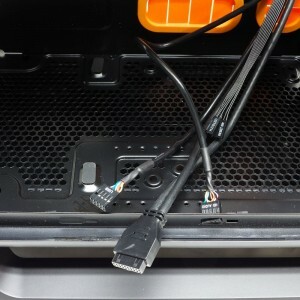 Our next picture shows case cables. 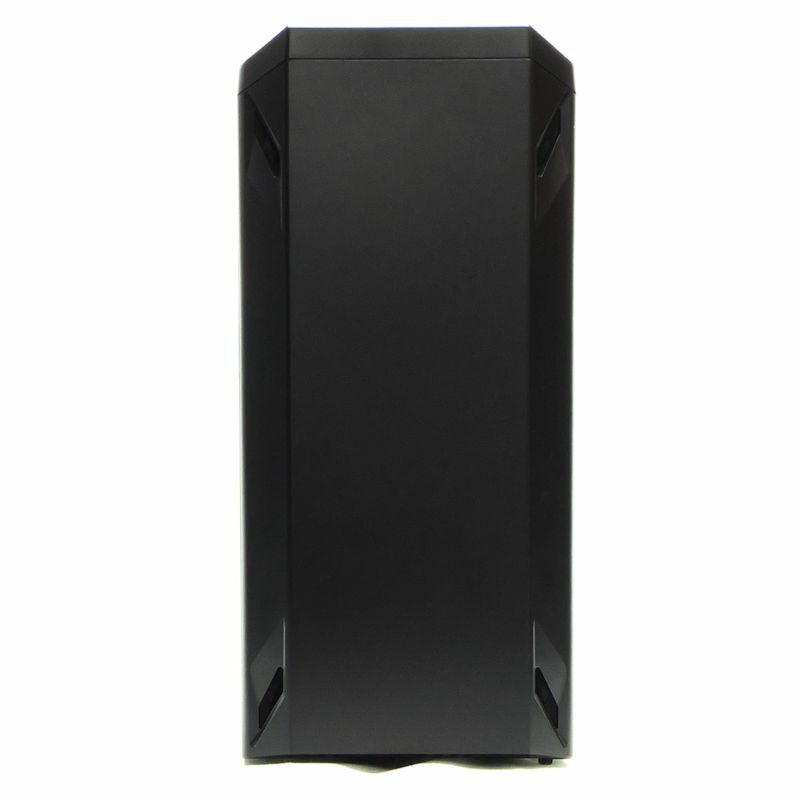 It starts with the dual USB2 plug and moves to the dual USB3 plug. A nice surprise is that the HD Audio is alone – no outmoded plugs flapping in the breeze. I won’t even mention its name, so as not to summon the dead. 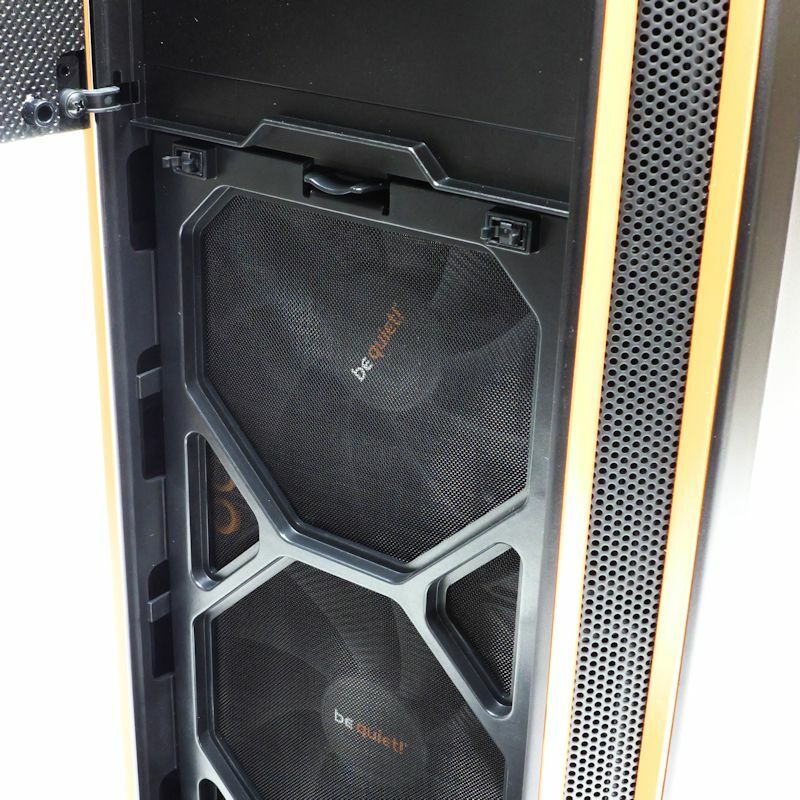 The front of the case with the fans off. 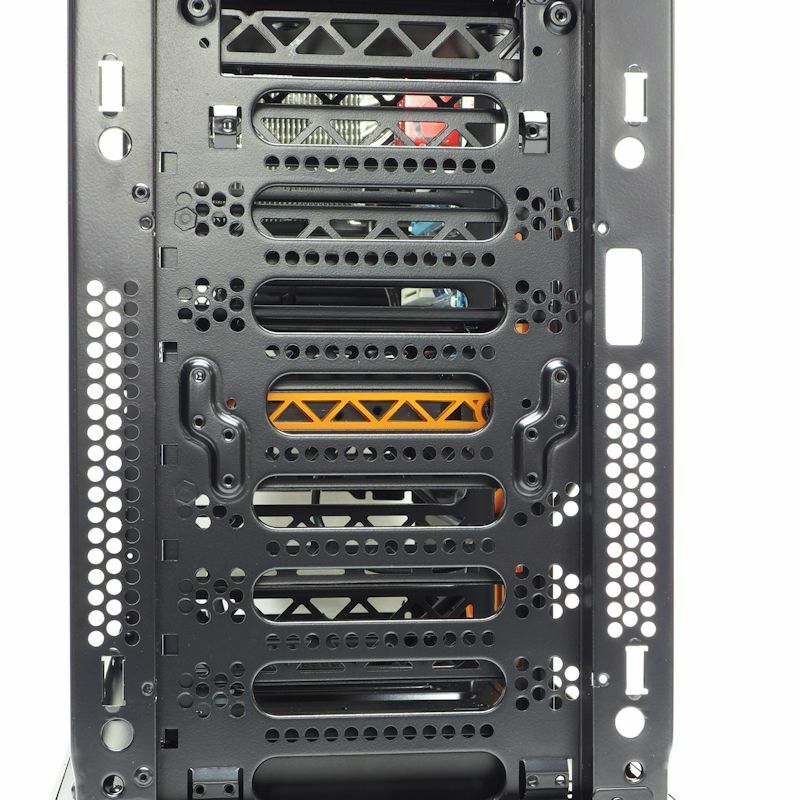 I suppose this half-grill might be OK for a case where the HD cage matched the front. But here, there is no such congruency. Also, you are supposed to be able to mount a 120/140 mm radiator here. Why block some of the air? Back inside the case, we have to note the center king post and the raised dimples set up for ATX motherboard screws. 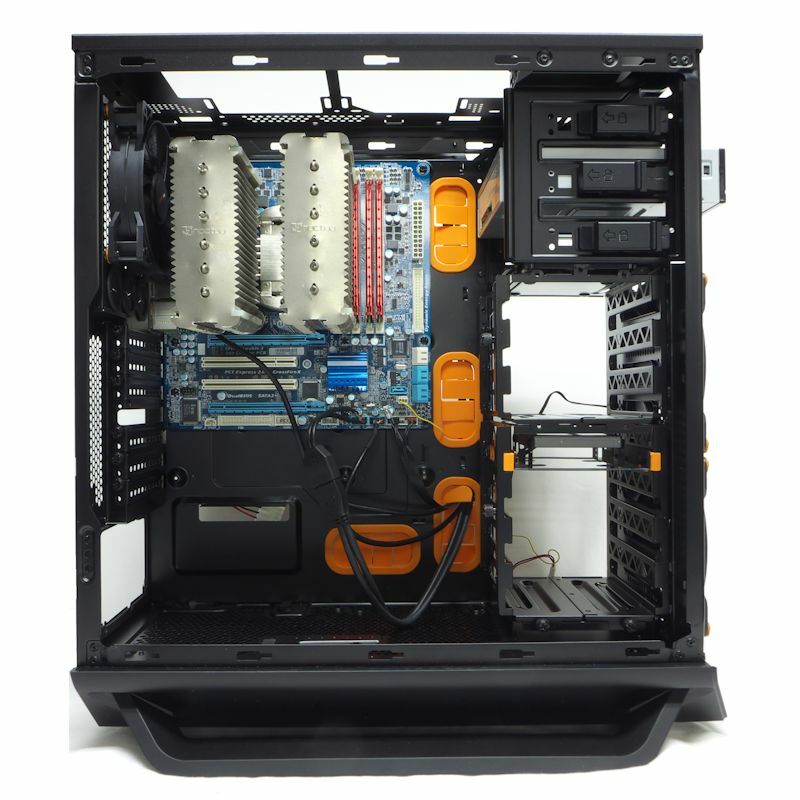 The king post in the center allows you to position your motherboard easily. The dimples actually guide your screws into the screw holes. 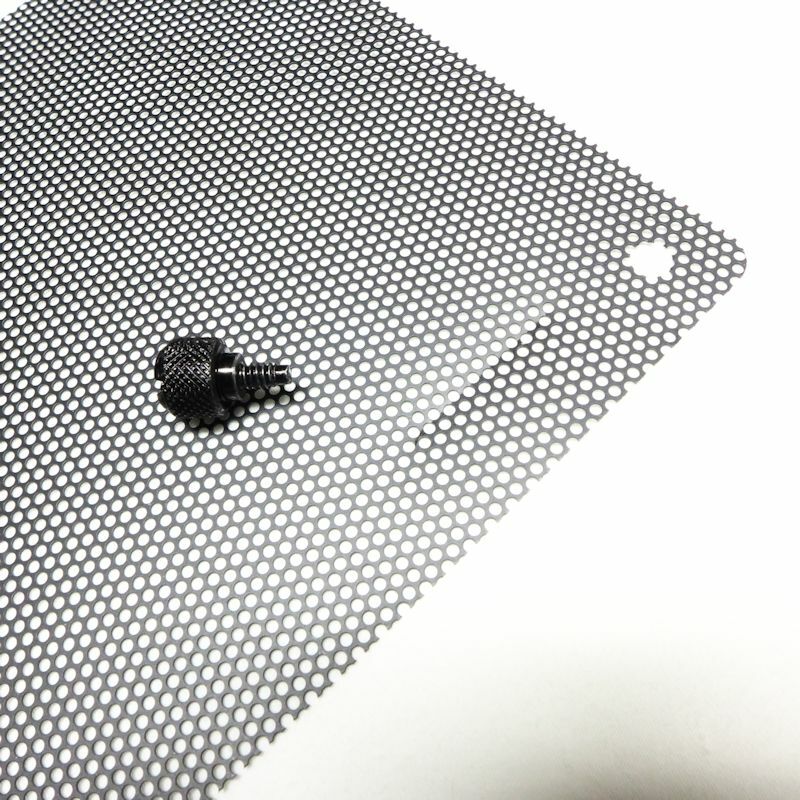 In one of the accessory bags there are two standoffs for mATX boards. The front door can be repositioned to open on the other side. Now we have fun. First, note that there are three thumbscrews holding the top HD cage nice and tight. There is another thumbscrew at the back. When you have unscrewed those, the cage slides out on two pairs of rails. 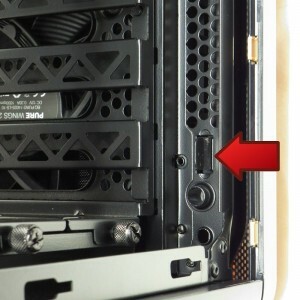 The upper rails are set into a piece of plastic, as indicated by the arrow. At the bottom of the 5.25” bay, four screws hold the plastic piece with the HD cage rails. They can be removed. 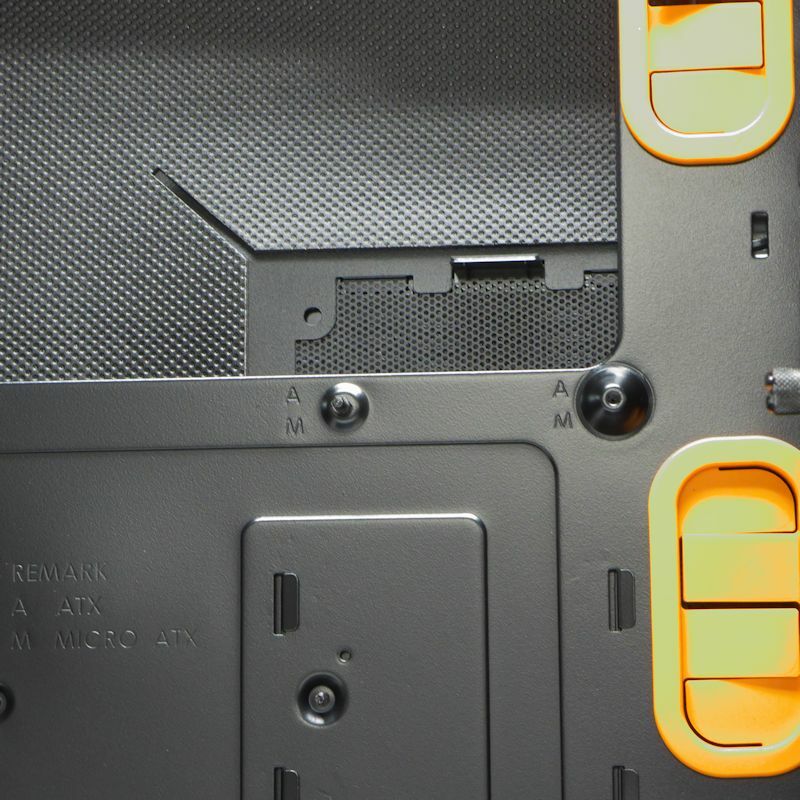 When the plastic piece is removed, we find that it has skewed screw holes to avoid it being placed incorrectly. It is two-sided. We also see two sets of mounting holes. 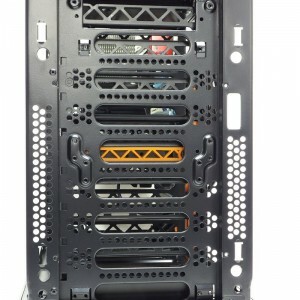 The first picture shows the HD cage with hard drives mounted in it. Note that the thumbscrew on the side operates a slide that locks the HD’s in place. The next picture shows the cage . . . in the 5.25” bay. In this picture, the plastic piece was mounted using the back holes to bring the HD cage forward. The logic of this indicates current thinking: few people use a DVD/CD/ODD any more. That leaves the 5.25” bay unused. 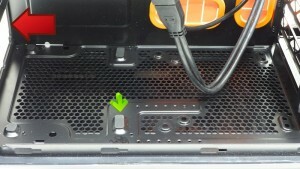 When a radiator is mounted in front, hard drives cannot go there. So the HD cage goes into the potentially empty 5.25” bay. Nice. It’s the first time I’ve seen this in a case. Sure, after market cages exist, but this is the first time the potential was built into a case. Then I pulled it all apart and reset the HD cage to its rear position. 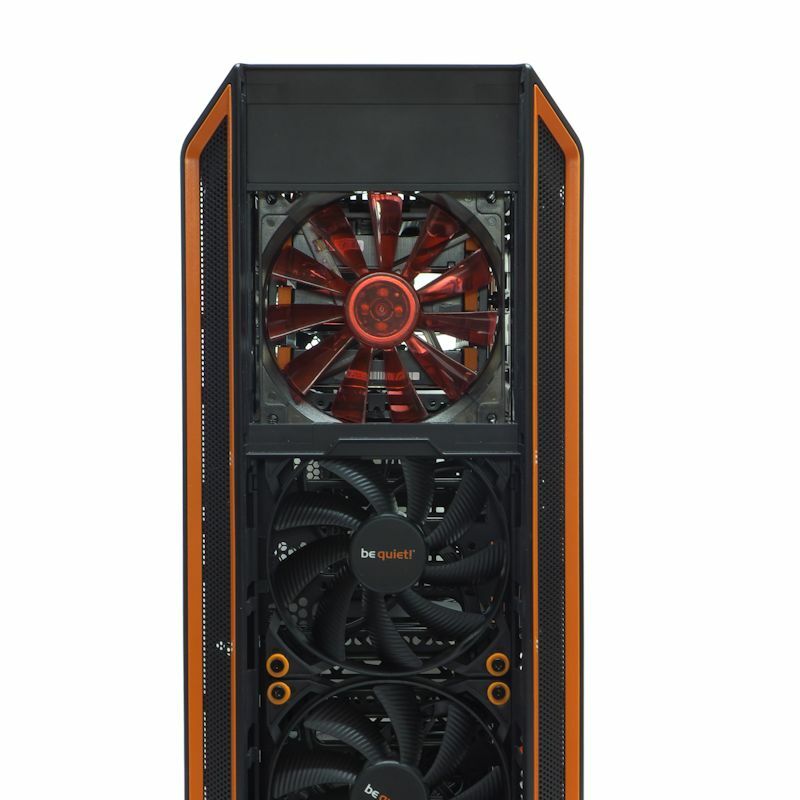 Then there was room for a 140×25 mm fan in front. We could use a filter here, and you will have to leave the front door open to use this, but the potential is definitely here. Note that I have filled up that HD cage with three hard drives. Here is an early build of the test system. 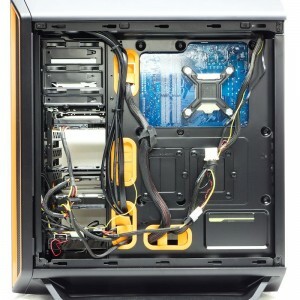 It has a mATX motherboard. 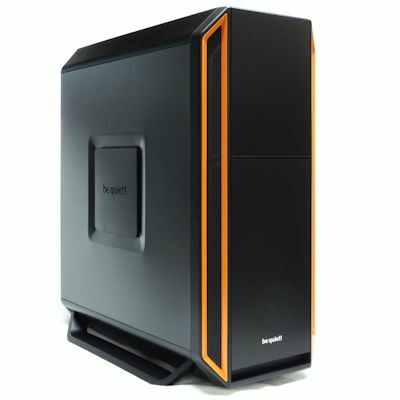 It has a passive NH-D14 (no fans) and a SSD. The hard drives have not been added yet. You can see the lack of a grill on top, and the ODD in the 5.25” bay. With the hard drives added and connected with SATA cables, one advantage of the open lattice in the HD cage becomes apparent. 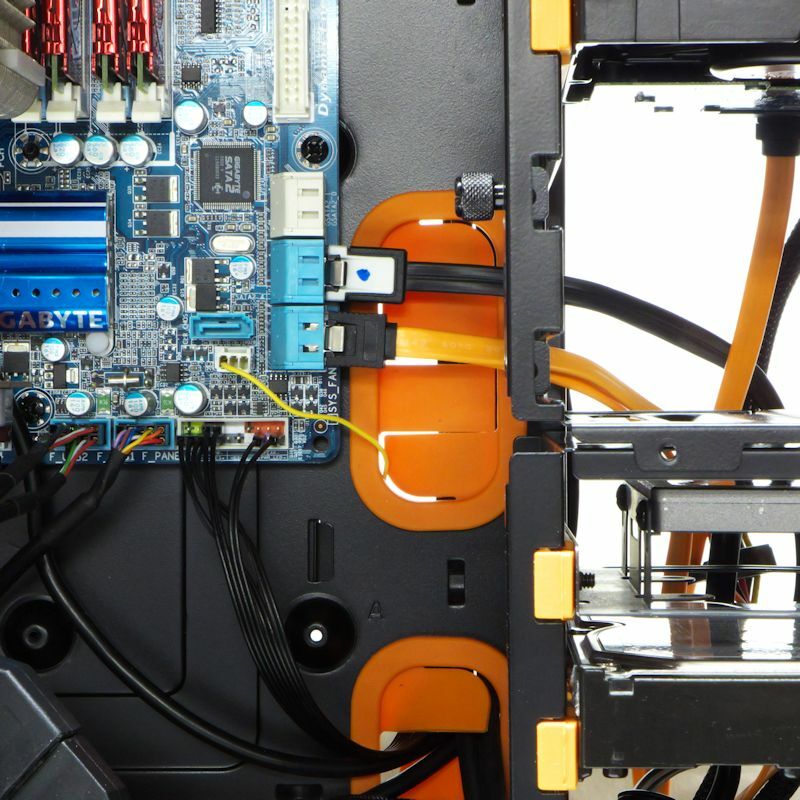 The SATA cables have a straight shot into the motherboard. No bending needed. 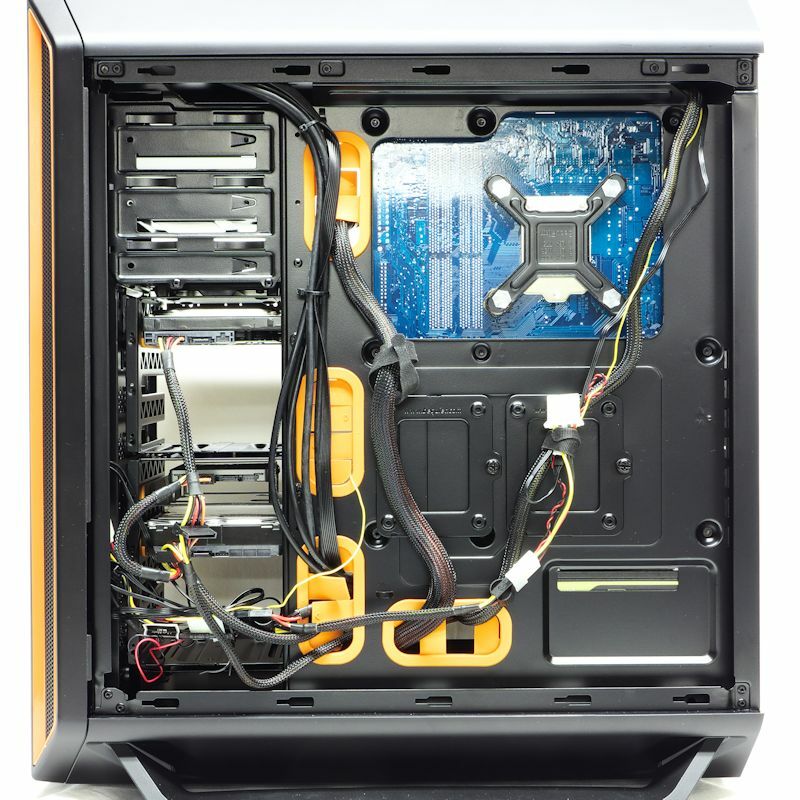 Here is what a built system looks like from the back. Oops. Looks like I had to use some Molex-to-3pin adapters to power the fans. They make a mess. 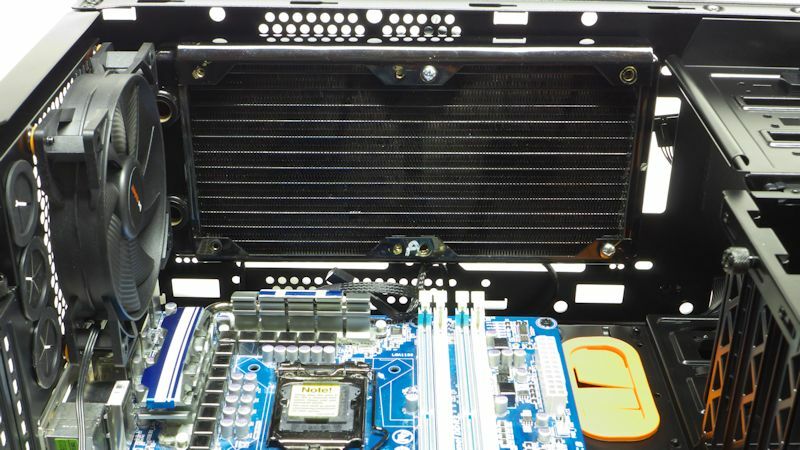 Note that the CPU window leaves lots of room around the CPU socket. There is just about 7/8” (21 mm) of space behind the motherboard for cable management. While this is adequate, it is not a generous amount. 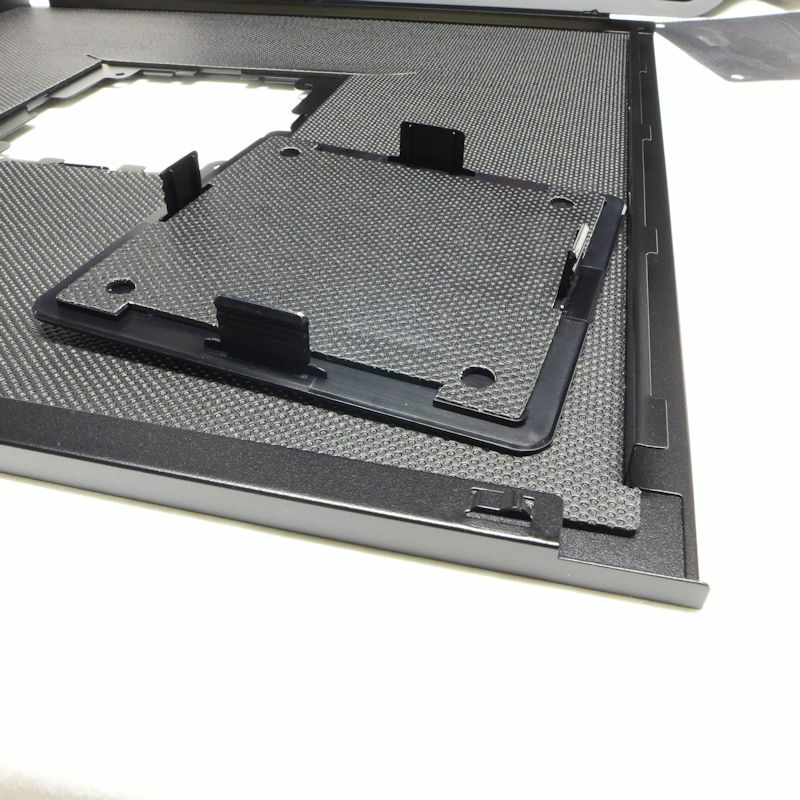 One other item – the plastic slide piece broke when I was putting the HD cage back in its original place. The manufacturer needs to loosen up the clearances by a hair to keep this from happening. Here is a full ATX board in the Silent Base 800. At the top of the cavity we seen a radiator, and perched on top are two 120 x 25 mm fans. 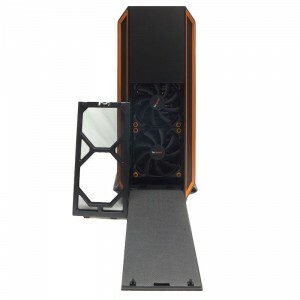 We clearly could have put a 280 mm radiator here instead of this 240 mm. The radiator is 30 mm thick, so we have plenty of room. 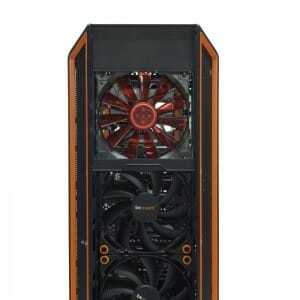 In fact, we could have put this radiator on top and let two 120 x 38 mm fans hang in the main cavity. The NH-D14 was installed several cases ago. That makes all the cases tested since then strictly comparable. We don’t have to worry about mount variation. OCCT 3.10 running a small data set produces a flat core temperature curve. This produced a set of four core temps, which were automatically logged. The ambient temperature was measured with the USB thermometer and automatically logged. The temp for core one (the hottest core) was averaged. 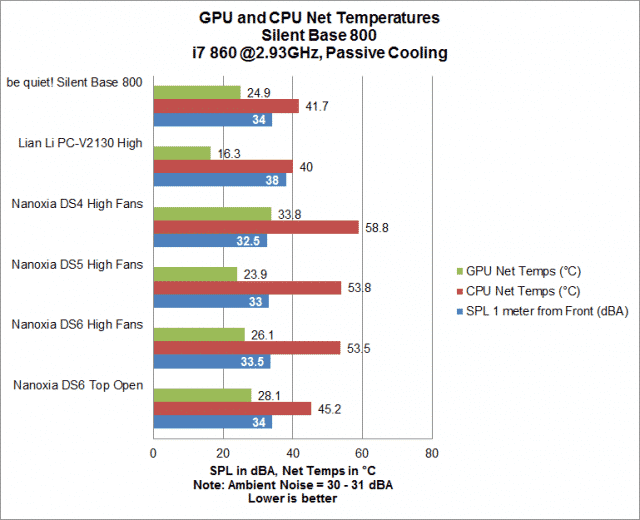 The mean ambient temp was subtracted from the mean core temp to get the net core temp. The mean ambient temp was about 21 °C. 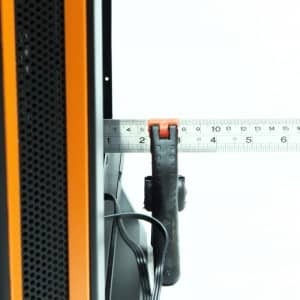 Sound Pressure Levels were measured one meter in front of the case in a basement where the ambient SPL was 30 dBA, which sounds like dead silence to the human ear. The SPL was reported as a net SPL. 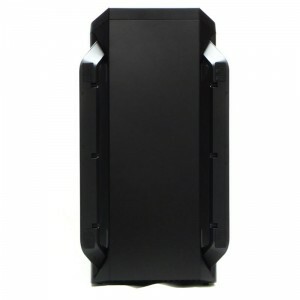 Well, aside from looking good, this case performed well. It is not the quietest case I have ever tested – you could hear a quiet sound. But usually cases this quiet do not cool very well. This is not the best cooling case I have ever measured, but it is significantly quieter than the only case to beat it. 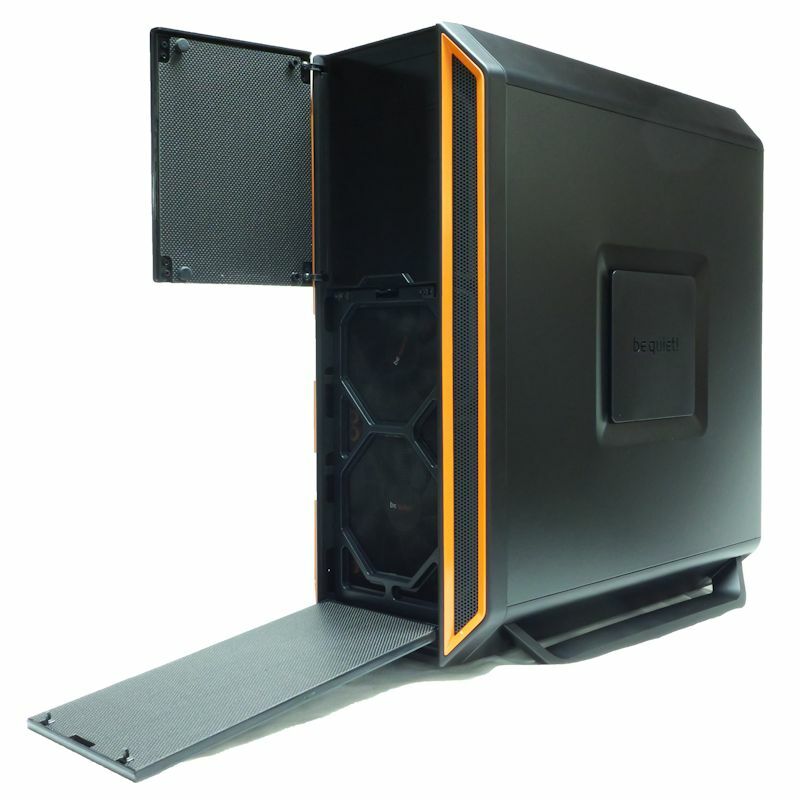 In other words, this is the P-51 Mustang of cases – not the very best in anything, but nearly so in everything. Fine case. This is a case that combines excellent performance, good looks and quiet operation. 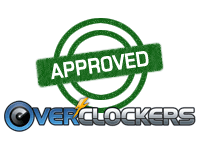 It also has a lot of add-ons that really give it flexibility. That said, there are lapses as well. We expect that be quiet! will fix those small lapses, and bring out a killer case. Working in the Silent Base 800 was a juxtaposition of ease with careful work. If you want to get at those fiddly little screws in the 5.25” bay for example, you will need a shorty Phillips screwdriver. 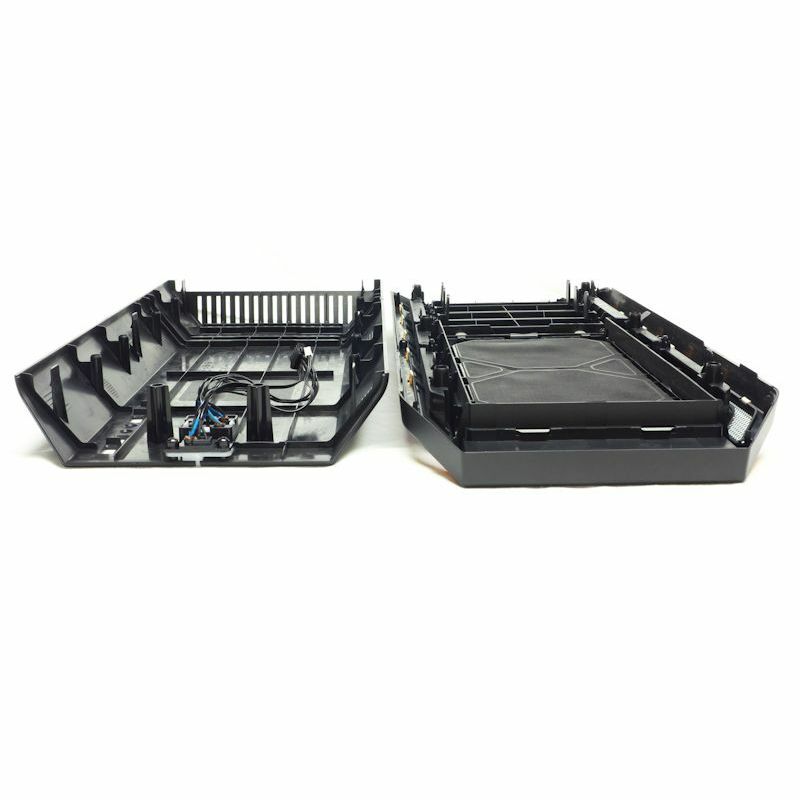 The ability to move the top HD cage is a very interesting feature – especially since it can sit in two positions. 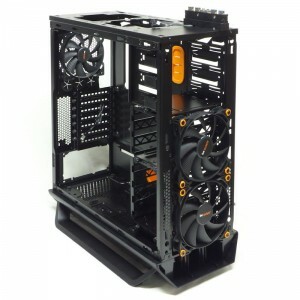 You may move the top cage and remove the bottom one, not just to put a radiator there, but simply to free up airflow into the case. The backsliding filter is an annoyance. 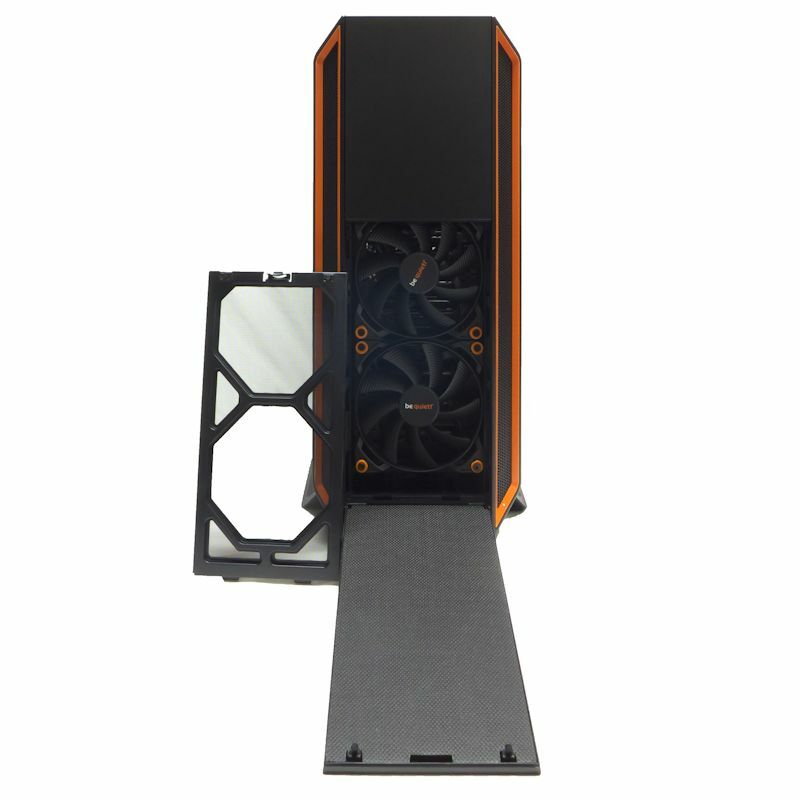 Why not set up the case so you could pull out the bottom filter through the front? But at least there is a filter for any bottom fan you might have. 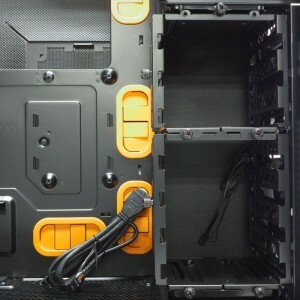 But note that you would have to remove four screws before you could slide the bottom cover off the tabs to get to where you would put screws in for that bottom fan. It’s like this all over: you have to do something technical to do something simple. Overall, though, it’s a good case. 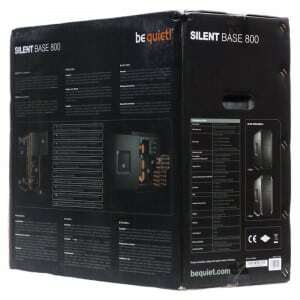 The MSRP stated for the Silent Base 800 was is $139.90 in November. Currency fluctuations may change that, but you can expect a price in that range once available in the US. Manual is too laconic. It needs to explain things more. Unnecessary grill in front; obstructs airflow. The front door blocks intake air for any fan you would put in the 5.25” bay. The plastic HD cage holder broke too easily.